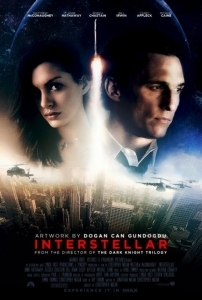 Interstellar is a 2014 science fiction film about a team of astronauts in search of a new habitable planet in order to save the human race. The main characters are Cooper, a widowed astronaut (played by Matthew McConaughey), Cooper’s daughter, Murphy “Murph” Cooper (played by Mackenzie Foy as young Murph, Jessica Chastain as adult Murph, and Ellen Burstyn as elderly Murph), Amelia Brand (played by Anne Hathaway), Amelia’s father, Professor Brand (played by Michael Caine), and Dr. Mann (played by Matt Damon). Here society at large represents the eagle eyes. A central theme in the movie is the tension between conserving the status quo versus exploring the possibility of new worlds. NASA scientists have determined that an agricultural blight will make human survival on Earth impossible for future generations. They believe that the only hope is for humans to leave Earth in search of another habitable planet in a distant galaxy. Society’s response, however, is to stop space exploration entirely and focus instead on increasing agricultural production. As the school principal tells Cooper when explaining why Cooper’s son must become a farmer instead of going to college to study engineering, “We didn’t run out of planes and television sets. We ran out of food.” Spending society’s scare resources on uncertain endeavors like space exploration is now seen as frivolous when the more immediate concern is having enough to eat. Explaining why the government has re-written text books to say that man’s explorations to the moon were faked, the school teacher Ms. Kelly tells Cooper, “And if we don’t want a repeat of the excess and wastefulness of the 20th Century, then we need to teach our kids about this planet, not tales of leaving it.” As a result, NASA’s scientists are forced to operate in secret. Although the film leads the audience to believe that the scientists are 100 percent sure about the future extinction of human life on Earth, rarely is the future so certain. For example, compare the blight scenario in the film to today’s scientific and political debates on climate change. Given the choice of a bird in the hand (food to eat on Earth) or two in the bush (the possibility of relocating the human species on a different planet), the ever-practical eagle eyes will choose the bird in the hand every time. Viewed in this way, the eagle eyes are not foolish, but shrewd. Psychics (intuitive types), which account for about 30 percent of the population, are receptive to perceptions arising from sources other than their five senses. The source of such perceptions, whether our unconscious mind or signals originating from outside ourselves, is uncertain and up for debate. But it is indisputable that intuitive perceptions—call them hunches, gut feelings, intuitions, a sixth sense, or epiphanies—can appear whole and complete without our being able to explain or discover how they came into existence. Psychics are by nature intuitive and imaginative, interested in possibilities, and more conceptual than factual. They learn by understanding, seek creative inspiration, and trust impressions. In the film, Murph demonstrates the preference for psychic perception. Ten-year-old Murph believes her room is haunted by a poltergeist trying to communicate with her. But rather than being afraid of the “ghost,” Murph trusts it and seeks to learn from it. She and Cooper eventually conclude that the “ghost” is an unknown intelligence sending coded messages through gravitational waves. Many years later, Cooper learns that future humans have created a multi-dimensional space so that they can save humanity by communicating with Murph through the “ghost” of her childhood. Using gravitational waves, Cooper is then able to transmit data to the adult Murph through Morse code and a watch he gave her as a reminder of his promise to return. The data allows Murph to complete Professor Brand’s equation and save the Earth’s inhabitants. Society credits Murph with a brilliant scientific discovery that saved mankind. But Murph knows that her eagle-eyed father was the true source of her genius. Yet, if Murph had not trusted the “ghost,” no scientific breakthrough would have been possible. Pointy heads (thinking types) make judgments based on objective reasoning–if this, then that. They rely on logic to justify their decisions. They are objective, impersonal, brief and businesslike. They decide based on true or false, enjoy debate, and seek truth. In the film, Professor Brand epitomizes pointy-headed judgment. Brand is working on two alternate plans for saving mankind. Plan A involves sending Cooper and Amelia to explore three potentially habitable planets: Miller, Edmunds, and Mann, named after the astronauts who surveyed them. A giant spaceship will then carry the residents of Earth to the planet found most suitable for human life. We later learn that Brand has secretly determined long ago that Plan A is impossible without additional data from a black hole, which is unobtainable. With Plan A being out of the question, he focuses on a Plan B, which will use frozen embryos to start humanity anew, while sacrificing Earth’s population. Brand must decide whether to share or withhold his knowledge and intentions with his colleagues, including his daughter and Cooper. Believing that Plan B is man’s only hope for survival, and that others will be unwilling to work on Plan B if they know Plan A is hopeless, Brand carries on an elaborate pretense that he will soon solve the equation for using gravity to propel the Earth’s population into space. Brand’s reasoning is logical, objective and impersonal—if he is honest, the human species will not survive; if he lies, humanity stands a chance. His calculus turns out to be wrong in the end, but only because he could not foresee that Cooper would transmit to Murph the theretofore-unobtainable black hole data. Bleeding hearts (feeling types) judge subjectively by weighing one thing versus another—is this better or more agreeable than that? They are personal and emotional, warm and tactful. They decide based on like or dislike. They avoid conflict and seek harmony. In the film, Amelia Brand epitomizes bleeding-hearted judgment. Low on fuel after a failed exploration to Miller, the team can travel to only one more planet before returning to Earth. Amelia believes Edmunds has more promise, but Cooper and Romilly (played by David Gyasi) favor Mann, as Mann is still transmitting and Edmunds is not. The team makes the logical choice for Mann. But when they land in an icy, inhospitable world, they find that Mann has faked the data about his planet’s viability so that he will be rescued. Mann’s deceit supports the adage that when dealing with people, it is wise to remember that you are not dealing with creatures of logic, but creatures of emotion. Note that Amelia’s rejected plea for a decision based on love instead of logic also implies a hint of psychic perception. Her statement that “Love is the one thing that transcends time and space”—which seems destined to become one of the most quoted lines in the film—suggests a belief that her feelings might be based on intuitive perceptions about the habitability of Edmunds and Mann that should be trusted and relied upon. Amelia wasn’t just deciding based on her love for Edmunds but also on her trust that her intuitions about the two planets were true.